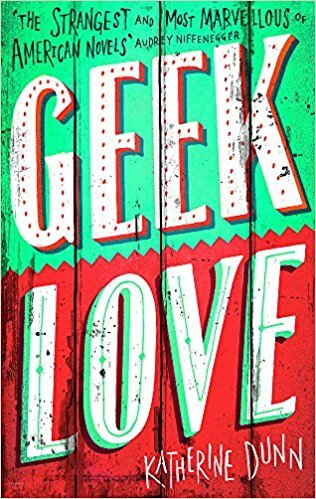 Today on The Tattooed Book I’m reviewing the alt-culture cult novel Geek Love by Katherine Dunn. With self-confessed fans such as Courtney Love, Kurt Cobain, Terry Gilliam and Flea from The Red Hot Chilli Peppers this novel has gained a huge fan base since its publication over 25 years ago. Aloysius Binewski is smitten with the latest addition to the carnival from her very first day. Lil had been a Boston socialite but the day she offered to perform the geek act, biting the heads off live chickens, he really fell in love. Years later, after a terrible fall ends Lil’s career, they marry and go on to manage the carnival together. However, times are changing; profits and ticket sales are down and they desperately need new acts to breathe life back into the show. Together they decide to take matters into their own hands and produce a family of acts themselves. Throughout Lil’s numerous pregnancies she pops pills and exposes herself to radiation to ensure their children come into the world as unusual as possible. Not all their attempts are successful but five of their offspring make it past their first year. Electra and Iphigenia enter the world as Siamese twins, two very different girls sharing one set of legs. Arturo, who goes on to be known as the Aqua Boy due to his lack of fully formed limbs, with appendages that appear more like fins. They almost abandon Fortunato (otherwise known as Chick) at birth when he appears to have no physical abnormalities at all. But one day, after being left unfed and becoming angrier than he’d ever been in his life, Chick manages to physically move Lil with just his mind. Last but no means least is Olympia, a dwarf, hunchback albino whose afflictions aren’t shocking enough to draw a crowd, leaving her the workhorse and carer for her siblings. Request something unique and unusual in any good bookshop across the UK and Geek Love is sure to be mentioned. Just a handful of pages into the book and it’s easy to see what all the fuss is about. The plot and characters may sound over-the-top and too far-fetched to be anywhere near believable, but the way they are described and nurtured to life leaves you too engrossed to worry about realism. Written from the perspective of Olympia, the tale sees her reflecting on her childhood as she befriends a woman she plans to harm. You follow the brutality of her upbringing and are given an insight into a unique world where a mutation is power. The children are never exposed to the real world, the controlled madness of the carnival being all they know, the isolation and family competition allowing Arturo to change into something truly monstrous. Geek Love is as dark as you can imagine, flipping from deeply disturbing one moment to strangely heart-warming the next. On one hand, this is a tale of ‘freaks’ and evil, but on the other, it’s a love story about a woman who will do anything to protect her nearest and dearest. This novel isn’t politically correct and is sure to upset some people and although this brief description may make it seem like a book based on shock factor, it really isn’t. It’s beautifully written and utterly captivating. If you want a novel that will shock you, push you to think and stay with you for a very long time, then look no further. Geek Love is as unsettling as it is brilliant.